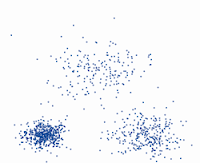 Estimating the correct, or most reliable number of clusters, namely cluster validity, is of importance in clustering. For more details about clustering and cluster validity, you can read these three posts: part1, part2 and part3. In the recent literature, a lot of work has been done on clustering and on developing indices that are able to give you an approximate of the number of groups in a set of points. It is interesting to see that most of these indices estimate the number of clusters from two to K_max. The one cluster case seems to be of no interest. It is surprising since this subject has already been studied in 1970 or so. The importance of the one cluster case has been noticed by Gordon (1). The book chapter by Gordon is full of information regarding concepts behind clustering. For example pointers to holder papers giving definitions for a cluster are given. However, I have found no recent work dealing with cluster validity and unique cluster. Does this mean that clusters always exist at least by pairs? (1) Gordon, A.D. Data science, classification and related methods (eds. Hayashi, C., Yajima, K., Bock H.H., Ohsumi, N., Tanaka, Y. and Baba, Y. ), chapter Cluster validation, pages 22-39. Springer, 1996.